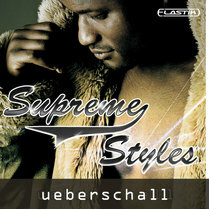 Supreme Styles, based around Ueberschall’s Elastik loop player, covers a range of modern urban styles, with a fair amount of its focus on guitar?based sounds, oddly, which is something not exactly hinted at by its title. Let’s jump straight into the numbers: Supreme Styles’ 4GB worth of content is split into 30 kits, whose tempos range from a very laid-back 58bpm to a more upfront 127bpm. Each kit is then split into sections: Intro, Main Kit, Variation and Outro. Each of these sections contains a main mix and all of the component loops. The kit is then rounded off with a collection of all the single drum hits used. All of the loops within each section are spread over the keyboard, starting at C1, and can be filtered, panned, reversed and sync’ed to a new tempo, all within the Elastik player interface. Style?wise, to my ears, the kits tend to sit within the smoother, chart hip?hop/commercial R&B/street soul side of the urban genre (although the lines are becoming increasingly blurred). Everything is put together skillfully but, to my mind, the collection is perhaps missing that little bit of attitude and edge to lift it above an already crowded market of equally well?produced competitors. As far as the individual elements go, the guitar loops and licks are the highlight of this collection, perhaps unsurprisingly, given their emphasis in the accompanying blurb. Overall, the guitar work is well played, well recorded and refreshingly tasteful. The effects are well chosen and rarely overwhelm proceedings, tending to remain quite subtle and in keeping with the genre. There are some nice Latin touches, as well as plenty of solid, soulful, muted guitar picking and strums. As well as the fret work, there’s also a good line in supporting instrumentation, with electric piano licks, synth lines and string beds that settle back nicely in the mix. If there’s anything that lets this collection down slightly, it’s at the bottom end. Sure, the bass is deep, but it somehow remains slightly uninspiring, with some rather workmanlike choices of bass synth. This is also true of the beats, which roll along fine but still seem to be missing an edge and are occasionally a little percussion-heavy for my taste. Of course, the beauty of the construction-kit format is that any superfluous percussion can be easily stripped out, although it may be trickier to squeeze a bit more swagger in. Overall, Supreme Styles is yet another well?made selection of urban construction kits that, although lacking in attitude in places, is still packed with high production values and commercial appeal. The heavy emphasis on the guitars may not be to everyone’s taste, but they are handled very well and provide a unique selling point.